Welcome back for another round of Mystery Ingredient Monday! 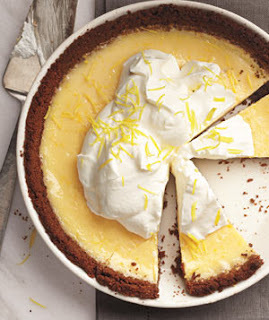 This week, I used Real Simple's Lemon Cream Pie recipe. I made it last year for Easter, and it was delicious, but the gingersnap crust they recommend...the proportions are off in there somewhere, it usually ends up as something you have to chisel off the pie plate. This time I went the convenience route and used a pre-made graham cracker crust that I baked empty for 10 minutes while the oven preheated, (sacrilege! I know!) After that, with a little mise en place, I was able to make the filling sitting at our coffee table, so I didn't miss any of The IT Crowd. I loved that the filling didn't involve tempering eggs or anything fussy like that. The hardest part was waiting for the pie to chill after baking to top it with whipped cream, and enjoy the fruits of my labor. After teasing Tasha about so many desserts, I had planned on a savory use of lemon too. It'll be happening tonight. 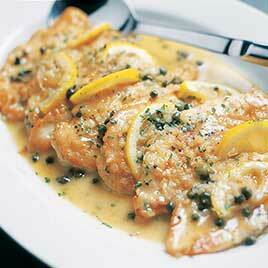 We're making America's Test Kitchen's Chicken Piccata. My mouth is watering already. Here is an adaptation of their recipe. We'll be halving it, but I imagine, most of you are doubling rather than halving recipes. My mother-in-law decided to get in on the action for this week's Mystery Ingredient. She's beginning to amass quite a collection of citrus trees in her back yard. Here's Mark, harvesting her grapefruit back in January. Maybe about 2 years ago she added a Meyer lemon tree. 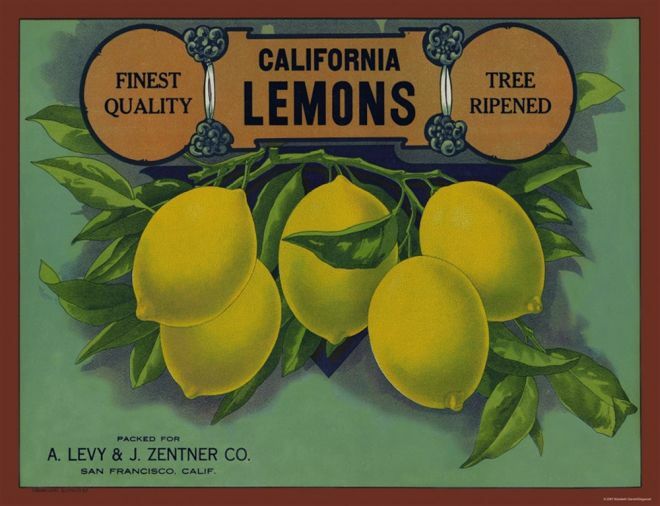 It was hit by storms last year, so there wasn't much fruit, but this year, so far she counts around 35 lemons. Not growing up around fruit trees, I'm impressed/amazed by two things. 1.) How this lemon tree is bearing fruit, even when it's so little. Wikipedia tells me these trees are usually between 6 and 10 ft, but they can be pruned smaller. This one comes up to my waist. Compare that to her grapefruit tree, it takes a ladder to get to the highest branches. 2.) 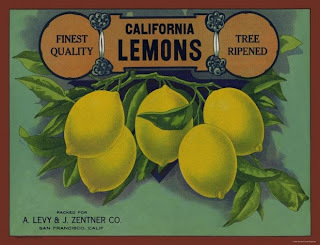 And just how many lemons are on each branch, how are they holding themselves up? Awesome tidbit about citrus trees, if you crush their leaves they smell like the fruit. I've tried it and these leaves do indeed smell like lemon. So that was lemons here in Houston. What about at your place? Thanks for linking up. For more inspired recipes, go visit Tasha and Jessica to see how they featured the mystery ingredient. Jessica is up for picking next week's ingredient. So far she's done dark red produce: cherries and beets, maybe she'll go with dark red again...perhaps meat? Only one way to find out! If you want to play along but don't have a blog, instagram or tweet it #mysteryingredient, or tag us in a facebook post about your dish so we can marvel your creativity. See you next week! Ha. Your pie looks great. I'm totally snagging Marks grapefruit pic for the family photo album! That's how I'm going to envision him as he proposed. Stretching his arms out to give you a ring. Cute. Vision implanted and no convincing me otherwise. Thorntons drool for chicken piccata. Your pie looks great too. How does it compare with the Cook's one I wonder? You should come visit, make both, and let me tell you the answer. Yay! Yours looks WAY more fancy. I love it when you play along!